Lapis Lazuli literally means “blue stone” from Latin and Persian or Arabic. This gemstone is not a single mineral. It is a combination of lazurite, calcite, and pyrite, with small amounts of other minerals. Lapis Lazuli is one of the most sought after stones in use since man’s history began, and is a rich medium to royal blue with gold flecks (pyrites). Lower-grade Lapis is lighter blue with more white than gold flecks, and is sometimes called denim Lapis. Its deep, celestial blue remains the symbol of royalty and honor, gods and power, spirit and vision. This stone is a universal symbol of wisdom and truth. In ancient times Lapis Lazuli was most highly regarded because of its beautiful color and the valuable ultramarine dye derived from it. Lapis Lazuli was among the most highly prized tribute paid to Egypt, obtained from the oldest mines in the world, worked from around 4000 B.C. and still in use today. Lapis is an excellent stone for executives, journalists, and psychologists, stimulating wisdom and good judgment in the practical world. 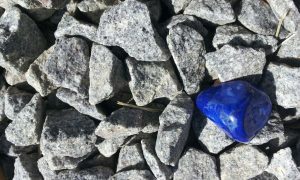 Stone aids intellectual analysis in archeologists and historians, problem solving for lawyers, and creates new ideas for inventors and writers..
Lapis Lazuli is a manifestation stone, also an excellent meditation stone. Meditating on a goal or quality you wish to manifest can bring this strong manifestation energy in. Lapis Lazuli is a powerful crystal for activating the higher mind and intellect. Stone is stimulating the desire for knowledge, truth and understanding. Being a great token for improving the memory. A stone of truth, Lapis encourages honesty, and also a stone of friendship and harmony in relationships. This is a stone of communication that can bring truthfulness, openness, and mental clarity. Mentally, the stone has helpful energy. It can bring mental and emotional virility and strengthen the mind. Stone is enhancing creativity. Its energy can help organize daily life as well as organizing and quieting a busy or restless mind. Lessening confusion, and increasing concentration. This strong inner power can also build courage, confidence, and overcome shyness. Hope brings trust that things will work out in spite of past traumas. The stone is decreasing irritability, whether caused by trauma issues or day to day frustrations. Dream work and dream recall are two mystical uses of the stone. Stone quickly releases stress, enhancing peace and serenity. Placed over the third eye, expands awareness and intuition. Permitting spiritual journey and tapping into personal and spiritual power. Lapis Lazuli is a visionary stone, bringing information to the mind in images rather than words. It can be a catalyst for higher awareness, and often aids those with past-life connections to ancient civilizations – Atlantis, Egypt, Peru, Sumeria and India, among others. Having Lapis Lazuli in a form of bracelet or necklace will enhance close contact with the stone, bringing stronger benefits and reflection of the stone in your life. Phoenix symbol is enhancing the powers of the gemstones, put together is a powerful energy token for everyone who carries it.